Is this strategy absolutely bullet proof? Every sync will start an own docker-container with a rsync/unison-daemon watching for connections. Done. No magic. But its roadrunner fast! And it has no pre-conditions on your actual stack. We use OSXFS to mount your local host folder into the sync-container. We do not mount this in the app-container directly, since this would lead to infamously horrible performance. 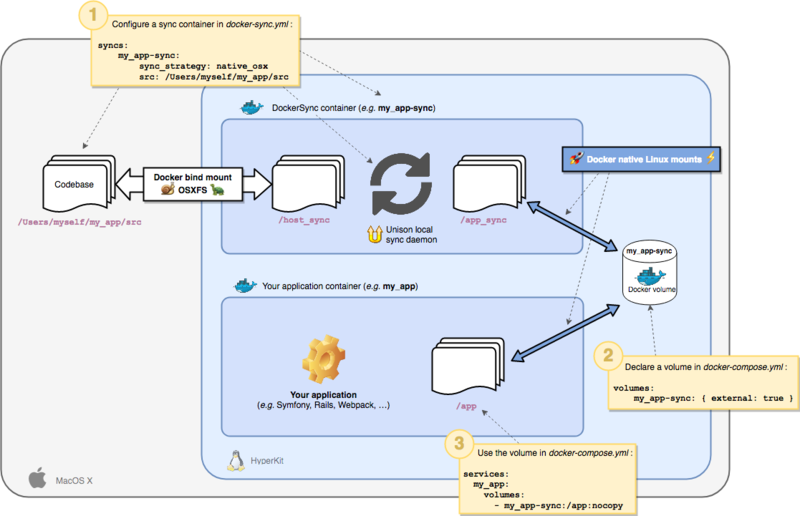 Instead of directly mounting /host_sync in the app-container we setup a 2-way-sync inside the sync-container using Unison. This ensures that the actual READ/WRITE performance on the /app_sync folder is native-speed fast. This makes all operations on /app_sync be asynchronous with /host_sync, since writing and reading on /app_sync does not rely on any OSXFS operation directly, but shortly delayed and asynchronous. We mount /app_sync to your app_container - since this happens in hyperkit, it’s a Docker LINUX-based native mount, thus running at native-speed. Your application now runs like there was no sync at all. There are several reasons, one of the most important being the performance. Since MacOS/OSX has very bad filesystem events support on HFS/APFS, watching the file-system for changes using unox or fswatch was causing a heavy CPU load. This CPU load is very significant, even on modern high-end CPUs (like a i7 4770k / 3.5GHz). The second issue was dependencies. With native_osx you do not need to install anything on your host OS except the docker-sync gem. So no need to compile unox or install unison manually, deploy with brew and fail along the way - just keeping you system clean. No, it is not. But it has been pretty battle proven already - the main issue is https://github.com/EugenMayer/docker-sync/issues/410 - so sometimes OSXFS just stops triggering FS events in Hyperkit, thus in the sync-container. This leads to an issue with our sync, since the unison daemon inside the app-sync container relies on those events to sync the changes (it does not have the ability to poll, which would be disastrous performance-wise, anyway). One instance which unison has been seen to misbehave is when quickly creating and deleting a file while it is processing it. unison may hang, using a high amount of cpu time: https://github.com/EugenMayer/docker-sync/issues/497. monit detects this high cpu usage (>50%) and automatically restarts unison to recover it. By default this happens within 10 seconds, but the tolerance can be configured in case there are normal spikes in cpu usage during successful syncs.